This image graces the cover of The Economist this week, my copy of which arrived in the mail this morning. Two things are worth noticing. The first is the seeming incongruity between the anti-capitalist OWS protester and the American flag he seems to be carrying. There is, it seems, an increasingly apparent disconnect between traditional "American values" like equality and freedom and the force of cash in the polity. When so much current talk about the movement has to do with the convergence (or otherwise) between OWS and the Tea Party, this seems like an important point to make. The second is the way the editors at The Economist frame the image. I cannot find a larger version of the cover, but even the thumbnail at left makes clear the upper border of the image is presented as having a roughly and unevenly torn edge. This gives a certain air of urgency, danger even, to the red on black headline - Rage Against the Machine. What is the point there? 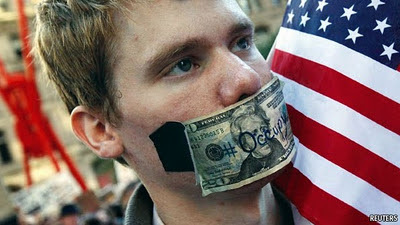 If anything, it seems that while frustrated and angry, the OWS folks have kept any "rage" they might experience well in check. To be fair, the cover essay acknowledges the reasons people have for their deep, abiding dissatisfaction with the political economic system - even as it then proceeds to sketch wholly inadequate remedies. But this cover seems to be locating the source of our difficulties less with capitalism and more with its vaguely threatening critics. What is rending the social and political fabric is not protesters who've reached the end of their tether, but the excesses of capitalists in both the economy and in politics. "What is rending the social and political fabric is not protesters who've reached the end of their tether, but the excesses of capitalists in both the economy and in politics."